Happy second day of Spring! 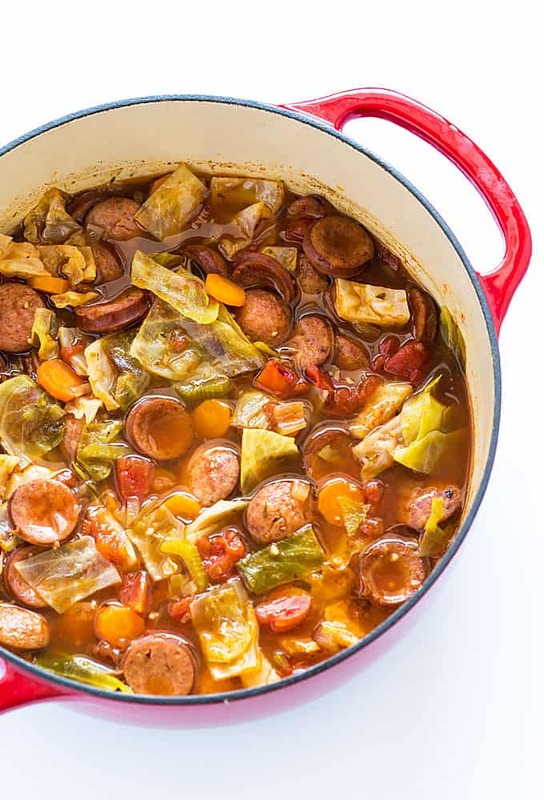 This Smoked Sausage and Cabbage Soup is full of flavor and loaded with smoked sausage and healthy veggies. It’s a new favorite recipe! 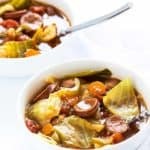 This soup was inspired by a craving for cabbage and hot cozy soup (although it’s spring it’s still cold outside here). You’ll definitely need some crusty French bread to soak up the amazing broth… it’s just bursting with flavor! The cabbage does need to simmer a while for it get tender, but once you get everything in the pot it’s basically on autopilot after that. Did I mention how awesome it smells while simmering?! It’s perfectly seasoned with oregano, thyme and garlic. I used beef broth but you can also use chicken broth in this recipe. It also reheats well and makes a great lunch for work the next day. Enjoy! In a dutch oven or large soup pot, heat oil over medium high heat. 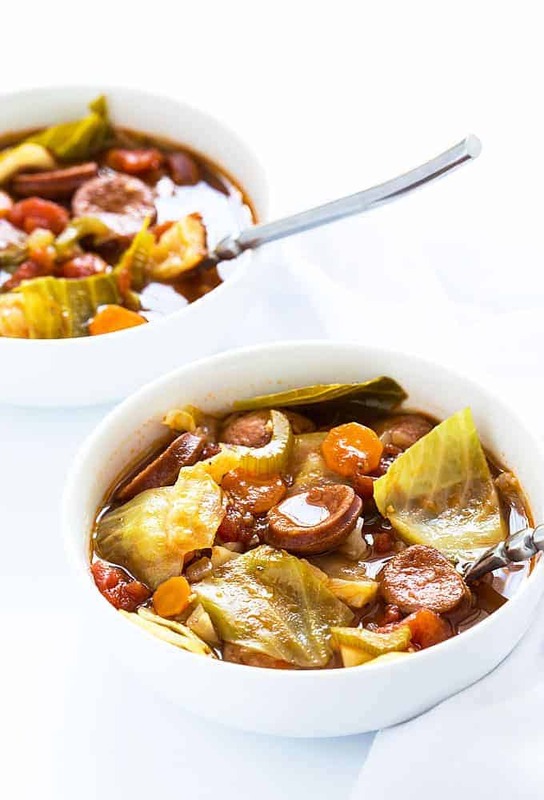 Add sausage slices, onions, carrots and celery and cook for approximately 7 minutes, or until vegetables are tender (stirring frequently). Add garlic and cook until fragrant (about 30 seconds). Add tomatoes with juice, broth, thyme and oregano. Stir well to combine. Bring to a boil. 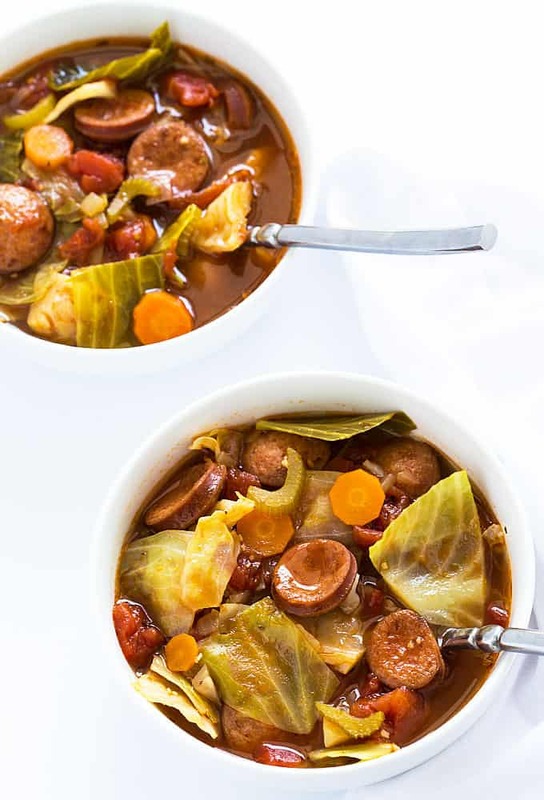 Once soup reaches a boil, add cabbage and stir well to combine. Reduce heat to maintain a gentle simmer. Cover and simmer for 50 minutes, or until cabbage is tender. Season with salt and pepper. 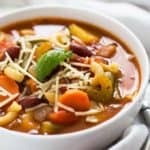 This soup will surprise you with it’s complex flavor since it is so simple to make. It’s the best soup I’ve ever made and I can’t wait to eat the leftovers. What the nutrition on this recipe? 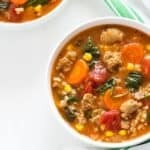 My family really enjoyed this soup my three-year-old and my five-year-old went back for seconds !!!!! Have you ever done this in the crockpot or instant pot? Hi Cristen, No I haven’t but am planning to in the future. Sorry I can’t be of more help at the moment… hope you enjoy if you make this version! This was delicious. Made it last night. Didn’t have thyme but added caraway seed’s and basil along with the garlic and oregano. Used salsa instead of tomato’s. Everyone had seconds. Will definitely make again. 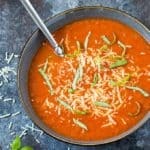 I’m looking forward to trying this soup, on tge stove now. Would you think it would be good if i added elbow macaroni? Have you tried that? Made this again last night. The first time I didn’t have the tomatoes or thyme. Had all needed to follow recipe exactly and WOW!!! The taste was so much better. Don’t need to change a thing. Will be making this again and again. Thanks for the wonderful recipe. 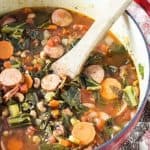 I’ve been making this soup for years. It’s my favorite. I boil it on the stove but have also done in a pressure cooker. Only takes 20 min. I also add potato chunks and a splash of white vinegar when it’s done. 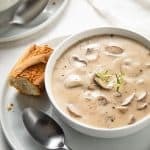 Gives it a little sour kick that complements the soup perfectly. I also throw in a handful of rice in mine. Love this soup! I’ve made it twice now and it’ll definitely be saved and made even more. Thanks so much! If made in the crockpot, how long will it need to cook? 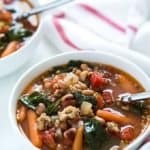 I made this soup with ground Italian sausage and it was excellent!